Grace Cale is a PhD student in sociology (full biography at the end). In this guest post, Grace makes an important distinction between “self-care” and “soothing” activities, where the difference is long-term versus short-term benefit, respectively, to our health and well-being. Are your usual self-care strategies just momentary distractions? Or, do they promote long-term wellness and balance? Read on to find out! Folks, it’s no secret: academia is not an easy world to inhabit. For many of us, while learning to navigate this unique place for the first time (or experiencing new difficulties), we often find that our usual mechanisms for coping with extreme stress cease to function effectively. This is the time where we give up trying to work for the day (or week), sit in an armchair cocooned in a blanket, and read articles on self-care. Self-care is important. It is a thing, which, to put it simply, allows us to keep going. Stress and work drain our little metaphorical bucket of energy, and self-care is supposed fill that bucket back up. This can be read on nearly any article on the topic. But, that is not why I am writing to you today. Some of these things work for some people, and that’s great. My long-time escape? Minecraft and comic-book-based movies and TV shows. But after a while of using this self-care strategy, I noticed something. These things served as a great distraction, but after several desperately-self-caring hours of such activities, I felt no more prepared to tackle the endless pile of work. As stress levels grew high enough to affect my physical health, I explored our university counseling services, where I discovered the difference between self-care and soothing. Clearly these things won’t fit all readers. But if I have had this issue, I imagine some others may have, as well. I discovered that the activities that I enjoyed, while pleasant, served almost as a security blanket. They soothed my anxieties in those moments, but did nothing to alleviate the problem of overwork. When a therapist first told me this, I panicked. Self-care has to solve my problem? My problem is too much work! The only way to make it go away is to work, but it never ends, and I can’t work 24/7, and and and … and figurative hyperventilation ensued. Luckily, eternal work was not the solution. Instead, to make a long story short, through various programs and meetings, I learned a valuable lesson: Self-care is vital, but is not always soothing, nor must it be. So, what does soothing actually refer to? When my therapist mentioned it, I was somehow mildly offended, as if someone had told me that I rely on a security blanket to get by as an adult. However, the metaphor is somewhat apt. Soothing behaviors, in this case, tend to be those things that, in the moment, calm your anxiety or worry. So, in my case, I was relying on distractions and entertainment to make me feel better, but these things did not actually provide any long-term healing, and did not strengthen my ability to cope with stress. It traded long-term growth in resilience for temporary soothing of discomfort. What we are left with, then, is the imperative to find some way of taking care of ourselves, which may or may not also soothe our stresses and anxieties, which actually provides for our longer-term health, well-being, personal growth, and so on. As academics who may or may not have these skills, we need to have methods of self-care which serve us and the careers and lives for which we aspire. But these necessary means of self-care may not provide momentary relief. Now, of course, if you find something that you enjoy and it actually refills your metaphorical energy bucket, by all means, do that. And it is certainly unwise to engage in “self-care” behaviors that are necessarily dangerous, painful, or so stressful that they are counterproductive. But I had believed that self-care must be something distinctly pleasant, enjoyable, or fun. For me, the magical solution ended up being two things I flatly disliked, and one thing I liked: yoga and mindfulness meditations, and studying a language (which happened to help my dissertation). These things may not work for everyone, but they did for me. Yoga provided low-social-pressure physical exercise (good for the bucket, and health in general), and required focus because of its difficulty (which helped keep me from expending energy thinking about work that I should be doing). For 10-20 minutes at a time, I would do guided meditations, which also helped me to divert my mind away from the energy-waste of constant work-oriented thoughts. It also turns out I loved studying a language, and the joy of learning helped remind me (in part) why I decided upon a career in research. It didn’t fix everything, but I did experience some improvement in my ability to function, and came down from the ledge of an overwhelmed breakdown. However, as we consume the nearly countless offerings of articles on how to be kind to ourselves in our lives and careers, let us not forget that while self-care might sooth our stresses in the moment, many soothing activities do not necessarily constitute real self-care. I write this long, winding story to remind folks of two key things: if you have a self-care routine that works for you and you enjoy it, by all means, do that. But if you’re still struggling to fill your little perseverance pail, try out some of those things people say you should do, even if you don’t love them. If you can stand it, give it a thought. Exercise. It doesn’t have to be public, easy or hard. But do anything that you can actually keep up regularly. I do yoga video podcasts in my home office. Try meditation (some of the benefits are supported by research), or creative writing, or whatever you feel gives your brain a break from its constant processing. We all signed up for this academic life. While we sometimes question those decisions, three things are for sure. It’s a ton of work, it’s exhausting, and we’ve got to keep our wells of energy full. We have to prioritize self-care in order to give our best to our communities, our departments, our students, and our allies in activism. We must, nay, we deserve to be well! Grace Cale is a PhD student in sociology. Having gained her undergraduate degree from a college that specifically accepts marginalized and impoverished students, she is a passionate ally to many causes of social justice. Her research interests focus on political participation, social movements, neoliberalism, markets, and financialization. She can be reached at cale [dot] grace [at] uky [dot] edu. Seth is a PhD candidate and adjunct professor at a large public university. His research lies at the intersection of feminist, queer, and affect theories, exploring the emotional experience of reading. He has taught classes in feminist theory, American sexuality, and gendered violence. He was diagnosed with bipolar disorder six years ago. In this guest blog post, Seth reflects on navigating graduate school, the classroom, and academia in general with bipolar disorder. Each night before bed, I pack my school bag. I carefully place the next day’s lesson plans, papers, and books inside, propping it on a certain chair at my work table all ready to go. The routine calms me. Two minutes later I retreat to my bedroom and take my now-reflexive drug regime of mood stabilizers, antidepressants, and sleep medication that will allow me to stand in front of my class and critique the very systems (big pharma and the mental health industrial complex) that have saved my own life. However, my students and most of my colleagues will never know this about me. In fact, from childhood and up to the point where I started writing my dissertation, I racked up several suicide attempts and had willingly overdosed twice. Some of this occurred while I have been in graduate school, but I have taken great pains to keep this information quiet. I know that I am privileged to have gotten emergency treatment on those occasions, to have insurance for my medications, and to be able to go to ongoing therapy even if it is extremely expensive on my adjunct salary. But most of all, I am fortunate have an accepting partner and chosen family. I am thankful for these things everyday; without them I would not be alive. I am a walking contradiction. I teach my students about celebrating difference, but I actively hide and conceal this part of my “difference.” Sometimes it is scary for me to even wear short sleeves during the summer because I worry my students will notice the self-inflicted scars on my arms while I am handing back papers. It’s not that I do not spend hours thinking about telling them. I constantly wonder if speaking about my invisible disability could serve as a transformative teaching moment. But I resist partially because I am afraid, and partially because I want privacy and to keep my dignity intact. Interestingly, I am out to my students as transgender; they know both my preferred and birth names due to the school’s computer systems and we talk about it in class. I feel no shame about my transition, social or medical. They have seen me physically change, pried apart my body with their curious eyes, heard me talk about my boyfriend as well as various ex girlfriends. But, I have never spoken publicly about having bipolar disorder or how this diagnosis, which came suddenly during my master’s degree, was devastating. I rarely tell people that during my initial episode: when I brought him letters documenting my disability and the accommodations I needed in order to merely survive, my Latin professor told me that my illness was just a sign I was not strong enough or smart enough for graduate school or academia in general. In that moment I learned that silence was the unspoken rule to sneaking through the maze of graduate school with mental illness. I never spoke about it again, until now. When I defended my master’s thesis a year later, it did not feel like a celebration of my achievements or scholarly future, but more a militant statement of productivity in the face of hate and discrimination. I showed up at the door of my doctoral institution refusing to register my disability with the campus disability office, knowing that the more that I could “pass,” the better. I now believe this was wrong and the result of an academic climate that values robotic productivity and turns away from any difference, physical, mental, or other. At my university, as with many universities in the United States, in order for a student to get accommodations or recognition for having any type of disability, they must register themselves through a disability services office that uses various criteria to determine what, if any, help to which they are “entitled.” For example, students with ADD might be given extra exam time, which the office decides on based on the students’ medical files. The problem with this model is that these offices run via a complex mixture of gatekeeping and fear. And with mental illness, something so personalized and dynamic, the situation is infinitely more complicated. Students needing accommodations due to mental illness first have to find doctors or therapists willing to meet them and then ultimately write on their behalf, all in a potentially new city and while on their own for the first time, sometimes without parental support or even understanding. Plus, this requires time, knowledge of insurance companies, and money. Yes, there may be a free counseling center on campus, but appointments can be booked months in advance (as with my university), so students often suffer in shame and silence. Given these barriers, faculty are faced with the difficult task of deciding whether to give accommodations to “undocumented” student. Often, these students will explain to their professors that they are coping with a challenging situation, but found the disability services office too scary to navigate, or that counseling services was full and they did not have a car or funds to get to an off campus therapist. For example, I’ve had students tell me they were mourning the loss of a parent and that they needed extra time for assignments because they were depressed and at times could not handle their homework. Some of my colleagues choose not to give any accommodations to these students unless the depression is a registered “reality,” because they say students lie. But, I always treat these afflictions as tangible and serious. To give up privacy in this way usually means something is truly happening. Even if the university processes students and their individual affective problems as broken worker bees who ruin the hive, I refuse. I always think about my Latin teacher and how he processed me. As someone with bipolar disorder who is heavily medicated, I consider myself to have a disability. I know this is not the case for every non-neurotypical person, but it has helped me mourn the loss of a certain type academic life I know that I will never have due to the limitations of both bipolar and its accompanying treatments. I am currently writing my dissertation, but it is taking me longer than other students. I go to conferences, but maybe only one major association a year and one smaller one. Every step I take, paper I grade, or time I set up a student appointment is influenced by bipolar. For example, I have had to cancel class numerous times when my medications were adjusted because I could not mentally focus on my course material; I cannot schedule exams too early in the morning because sometimes I am shaky or too tired to leave the house; I flinch and become jarred when my students scream out during class because loud sounds scare me. And sometimes, even my huge arsenal of medications and various treatment team fails me. But, that’s the nature of this illness: I get manic or depressed, which leaves me hoping I will not have to go to the hospital. Bipolar is always a student in my classroom every semester; I always wonder how much he will join the discussion. In an academic climate that favors unparalleled perfection and rewards those who reject affect-based learning, it would make sense why I have remained mute to my students (and lots of faculty) despite teaching classes on disabled sexuality and writing a dissertation focused on psychiatry, sexuality, and affect. I fear that I will be exposed as unproductive, incompetent, or weak. From Day One of graduate school, they told me the best scholars wrote the most books. With a life-altering illness, it is hard to think of myself as ever having that ability to compete on that level even though I technically haven’t even centered the arena because I am still in graduate school. Bipolar has taken so much time from me and I mourn it everyday I see yet another colleague publish an article or win a fellowship. I simply cannot do all of the herculean academic tasks demanded by the current state of affairs. I can do some and try to modify, like when I went to an Ivy League summer school and snuck away from several of the large evening lectures to rest in my dorm room and call home for some grounding. Humanities jobs are scarce (like we all know) and I am already at a disadvantage because of my health. I know that I need to adjust my idea of success and what it means. I am learning that this adjustment does not equate me with failure, just difference. Mostly at this point, at a time that I feel stable, I worry for my students who are learning that silence is the only way to get through college, that is it is better to fail a course than to tell a teacher about one’s anxiety or depression because the stigma of mental illness is worse than the stigma of perceived laziness. To those students I say: I may never see you and you may never see me, but we are not alone. Sarah Zarrow is a PhD student in Hebrew & Judaic Studies and History (full biography at the end). In this two-part series, Sarah describes her six-year-long struggle to find proper health care for a mysterious, chronic condition that followed stress and tragedy in her life. In this first post, her painful story highlights the inadequacies of university health services (at least for graduate students), and lack of concerns graduate programs hold for students’ well-being. Also, check out Part II! This is not a story about dating in academia, though it begins as one. I first met Kyle after he was released from police custody after being arrested for participating in a student-led action. I was immediately drawn to the way he didn’t seem to care about what anyone else thought, his anarchic style. As we got to know each other, this impression was only confirmed. He was clearly an oddball, and I loved that. But as our relationship progressed, I wondered if his “nutty professor” persona (which others named, as well) was perhaps not serving Kyle well. He could be moody and mean, and demanded that I fit myself into his life, and not ask for anything. He was difficult, but on the other hand, he was clearly brilliant. After all, who was I to know what it was like to write a dissertation, to be under that constant pressure? Kyle eventually broke up with me, claiming that I was an impossible person to love. After months of bad treatment, the relationship was over, and the grief mixed with a sense that a burden had lifted. But our breakup occurred just days before my second-year qualifying exams, as well as a large rainstorm that sent wet chunks of ceiling raining down onto my computer. My landlady fixed my ceiling. I took my exams through tears, and passed out immediately afterwards, exhausted from the stresses piled on top of each other. A few days later, I woke up in the middle of the night, feeling woozy and feverish. I chalked it up to some bad food, and perhaps to the combination of stress and coffee. I got up and walked across my room in the direction of the bathroom. I washed my face but didn’t feel better; as I opened the door to my room to head back to bed, I must have fainted. I came to on my floor with my roommate beside me. We figured it was some odd stomach illness, and she took care of me for the next few days. The approaching summer and my research trip abroad helped me perk up a bit, and I headed to Poland to conduct research and improve my language skills. When I returned in the fall, I was feeling much better. My anxiety had lifted, and I hadn’t fainted again. But my health adventures were only beginning. Still suspecting that my incident in the spring was a sign of something larger, I headed to various doctors at the Student Health Center (SHC). By my retrospective count, I saw seven different doctors. Not all specialties exist within the SHC, and some appointments and tests necessitated outside doctors. After receiving multiple large bills and arguing with my insurance, I realized that I was being referred not only out of the building, but out of network. By then, I had racked up a few hundred dollars in medical charges. I took on some extra teaching and tutoring to pay them off. No diagnosis was ever made. I was referred to a neurologist. Then to a cardiologist. Then to another neurologist. At one point, my primary care physician found an abnormally high cortisol level. But, she demurred, graduate students were all stressed out, and clinically high was “actually” normal. I was given anti-anxiety medication, which has certainly helped many people, but which I now suspect might have masked my underlying problem. Eventually, I stopped seeing doctors, as no one seemed able to tell me if I even had a “real” problem. More than a few doctors implied that my pains and fatigue, as well as the fainting, were “all in my head.” After all—I was a stressed-out graduate student, yet living, supposedly, a life of leisure, sitting at home and thinking and writing all day. At least this is how some of my professors, without ever asking us, described the graduate student life. Doctors might as well have said “hypochondriac” or “hysterical.” I was relieved on the occasions when I had a concrete, diagnosable injury or illness. I was thrilled when an X-ray revealed that my shoulder pain wasn’t a wandering womb or a sign of inanity, but rather a fracture. I began to identify as a sick person, reliant on others for care and treatment, despite knowing that I was actually quite resilient and capable. I focused instead on my mental health, and on small things that made me happy. I dated again, I began dancing, I began to believe that Kyle had been wrong, and that I had accepted his judgment of me because he was smarter (as he had told me), and because I had chalked up his quirks to typical oddball nutty professor behavior. After we split up, and he was subsequently kicked out of graduate school and devoted himself to working on his “manifesto” (his term, only half-joking, for his dissertation), I began to see that the problems in our relationship were perhaps not mine alone, and that he was truly suffering. But being so burned out from the experience of being together and breaking up, I chose to withdraw from most contact with him, rather than further engage and risk being hurt more. The year went on, and I began to prepare for my comprehensive exams. I came home from school one day, sat down at my computer, and was interrupted by a call from my roommate. Zach told me that Kyle’s house was on fire, and that it looked like Kyle had set it; he was currently in the hospital with severe burns. The next few hours and days went by in a blur of hospital waiting rooms, calls to family, and trying to remember to do things like shower and eat. As for work, I thought that I triaged well. I somehow graded exams, returned library books that were due, and let my professors and supervisors know what was going on. I kept my notes short, as I preferred correspondence from my own students—personal emergency, friend in the ICU, will be delayed with all work. In short, I think I handled the situation well from a professional standpoint. Eventually, Kyle succumbed to his injuries, and died after four days in a coma. Colleagues’ and professors’ reactions ranged from sympathetic to cruel, and it is only in retrospect that I can see the cruel ones as part of a larger problem. My advisor, with whom I enjoy a friendly but not warm relationship, was the only faculty member I encountered whose reaction didn’t leave me reeling. I went to meet with him, and he simply told me, after a brief inquiry into my own health and a reminder to avail myself of counseling services if necessary, to take the time I needed. I told him I would reschedule my exams, and I did. We never spoke of it again, though I’m certain I could have approached him for a chat had I wanted to. By far, the most painful response was from a professor whom I thought would be my ally, as I knew that she had faced her share of travails in the academy. I was taking a course with her at the time, and I emailed her to let her know what had happened – that I would not be in class that week, and would hopefully return the next. She emailed back to tell me that we needed to meet, specifically to discuss my course participation. I asked if we might postpone the meeting, or at least meet on a day when I would already be in the city. In no uncertain terms, she let me know that I would need to meet her near her house, over an hour commute for me. Over coffee, after hearing a brief version of what I was going through, she proceeded to tell me all about the problems her son had been facing, and how it was so difficult to deal with young men. I was floored as I realized that I had become her sounding board, and even more shocked as I realized that she considered this an act of empathy. After that meeting, I chose not to talk about my experience with anyone in the academy. I was lucky that I had support from outside of it: my friends and family, and a great therapist. I decided not to investigate whether I was allowed to talk time off for bereavement or sickness; as I was only serving as a grader that term, I could manage my workload. The acute emotional pain dulled, and I was able to take and pass my exams, and to finish most of my incompletes by the middle of the summer, putting me “behind” (whatever that means in graduate school) by only a few months. Though I began to feel better mentally, more like myself, my physical health started to take some mysterious turns for the worse. I spent that June in Vienna for research, sharing a lovely apartment and comforting myself with small archives and a peaceful, easy city. My last night there, I woke up suddenly in the middle of the night. I was disoriented and flushed. I knew that I needed to get out of my loft bed immediately. Thinking that perhaps I had food poisoning, I climbed down the ladder and tried to make my way into the hall. All I remember next is my roommate cradling my head, as I lay on the floor, my face throbbing. I had fallen and hit my head, given myself a black eye, and put my tooth through my lip. It is only recently that I realized that I could have died, not from hitting my head, but from what caused it. But figuring out the cause would now take on the feeling of a second job. Had I stayed in Vienna, I would have seen a doctor, but my research brought me next to a city known more for bureaucracy, bribery, and spurious “cures” than for good health care. So, I figured that I would take my chances and see a doctor once I came home. When that time came, I was again feeling much better, except for my mouth, which was still throbbing. Our health insurance doesn’t cover dental care, though, so I put off seeing anyone about it. I didn’t need a root canal, luckily, which would have cost about 1,000 dollars – money that I didn’t have. But, that money nevertheless ended up going to cover my hospital expenses when another doctor was concerned that I had epilepsy. During my four days of constant monitoring, I graded exams, and didn’t tell my professors where I was. I wasn’t sick, I felt fine, and I was starting to feel as though I might have exhausted the goodwill that had been extended to me. We all know a person with so many problems that we wonder whether they bring it on themselves. I didn’t want to be that person. In the end, it took three more years to find a doctor who listened, and a diagnoses (and treatment) that made sense. My health’s ups and downs, and the care they sometimes required, strained many relationships, and broke one. Luckily, at an unexpected moment, a new doctor thought to repeat some tests that I had years ago, including the one that prompted my PCP to say that “all graduate students are stressed.” My levels were so far off that it was now almost obvious what had been happening to me. I had planned to graduate in December of this year, but my extensions and emergencies made that impossible. May graduation deadlines loom, and I’m determined to walk this spring. But graduating will also mean losing my healthcare, and purchasing a cheaper plan for myself, so I have been trying to find as many answers as possible in the time that remains. For many people with some mysterious or chronic condition, going to doctor after doctor in order to find the culprit for their health problems is just part of the process of getting proper treatment. It’s not news that our healthcare system is set up to discourage good primary care and treating the patient, and her body, as a whole system, rather than as a series of parts—a heart, a brain, a nervous system. Getting proper care becomes a job in itself, and “overuse” of the system draws suspicion. Student medical services designed for 18-22 year olds do not serve many graduate students well (they probably don’t serve undergrads well, either), as I also know from my fellow students’ stories. It is these stigmas, which go far beyond the academy, combined with stereotypes about graduate students, which together serve as barriers to proper care. When health professionals do not see graduate students as individuals, and as people in distress, but rather as collections of oddball tendencies and stress, proper diagnosis and treatment are impossible. Sarah Zarrow will receive her Ph.D this spring from the joint program of the Skirball Department of Hebrew & Judaic Studies and the History Department. 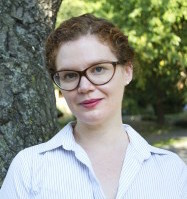 She concentrates on modern European Jewish history, with a particular focus on Jews in Eastern and Central Europe and on cultural and linguistic practices. She also holds an MA in education. Sarah has taught at NYU and Eugene Lang College/The New School, and is at work on many digital projects. She can be found online at sarahellenzarrow.com. Over the summer, I received a notification that my online university accounts at my graduate institution were terminated. It had been a year since I officially graduated and began working at another school. I knew that this moment would come eventually, but I was surprised that I felt the slightest bit of sadness about it. This was it. That chapter of my life was officially over, and my ties to the institution no longer existed (excluding friendships and professional relationships, of course). I could not wait to get out of graduate school, but I have continued to struggle to recover from it over the past year and a half. I had hoped that I would write a few posts to work through what I called “graduate school garbage,” and make available the experiences and resources that were not available to me as I attempted to forge my own career path. Shortly after, I would shift to providing advice for graduate students and fellow junior scholars. But, that has not happened yet. Over a year after I made the public declaration to pursue tenure my way, I continue to struggle with fear, self-doubt, and the emotional baggage of graduate school. Although the elimination of my online accounts made the chapter’s end officially official, I already suspected that I was overdue for beginning to move on with my life. On occasion, I have successfully churned out an essay of advice. But, I sometimes have to write out the awful experiences that led to suggestions for better ways of doing things; I simply delete that part of the narrative, or use it sparingly to contextualize my advice. During my last attempt to write a post on advice, I had a page-long rant about graduate school with no advice, which I ultimately deleted. I feel stuck. Why am I still working through the trauma of grad school? Am I forever changed, or will the disappointment and resentment dissipate over time? Moving on will not be enough. Or, as we mean “move on” in a casual sense — just stop thinking about the past and focus on the present — will not be effective, at least not as quickly as I would like. It recently dawned on me that the key to successfully moving on is probably to make peace with the previous chapter of my life. That is, it is time to forgive everything and everyone related to my graduate training. What would it mean to forgive graduate school? I realize that it sounds odd, that I am implying that I have been wronged in some way and have decided to forgive. I was not intentionally harmed or deceived or excluded by someone or something (well, rarely, if ever). But, I suspect thinking only of intentional wrong-doing as acts that are forgivable is what makes this seem odd. I see offering forgiveness, in part, as finding good or positive intentions within a limited, complex, or even oppressive context. I can use my parents’ journey to accepting me as their unapologetically queer son as an example. If I refused to understand their initial disappointment and fear from any perspective other than my own, I likely would have stood my ground in cutting ties with them at age 19. They wanted to protect me from homophobia and the consequences it has in queer people’s lives; but, they failed to see how their own intolerance contributed to those hardships in my life. After some time, I realized how hard I was on them, demanding immediate and total acceptance (or else kicking them out of my life). I ignored that they had been raised in a homophobic society, and did not have the knowledge and skills (and confidence) to support a queer child. Graduate programs have a set of norms, values, and practices that, unfortunately, often do not reflect my own values, needs, and interests. I came to graduate school as an activist, and wanted to leave graduate school as an even better activist. Whether I agree with the sentiment that academic careers are not designed for scholars with activist leanings (I surely do not agree! ), the heart of graduate training is research with a sprinkle of teaching (if you are lucky). When put in those terms, it does not make sense to resent grad school for failing to train me as an activist; that is like damning an eye doctor for failing to address my anxiety. But, to my credit, it was not made explicit until midway through my training that academia and activism do not mix (in some people’s minds). There were mentors who did support me as an activist, though to the best of their abilities as academics and within the bounds of what graduate training is really about. This recognition seems crucial to beginning the process of forgiving. My mentors did the best that they could, and their intentions were to mold me into a strong scholar so that I would have as many professional opportunities as possible. Since formal training for graduate education is uncommon (does it even exist? ), it seems many professors simply mentor in ways that worked for them, or in ways they wish they were mentored as students. In many ways, it seems like parenting; there are a plethora of books, but no real, universal guide to being a good mentor. They make it up as they go. And, as with my parents, my advisors probably struggled with knowing how to mentor a student like me. I should be clear that, in forgiving graduate school, I am not excusing negative or hurtful things that happened to me. I see many problems with graduate education that warrant improvement. And, it seems silly to challenge myself to forget the foundational training of my academic career. At this early stage — in which I acknowledge I am a novice at this notion of forgiveness — I see this journey primarily as understanding my graduate training from a broader perspective, and choosing to focus on and appreciate the positive aspects of that chapter of my life. First and foremost, the need to forgive everything and everyone is urgent because I need to move on. It does me no good to carry baggage from the previous chapter of my life. I am getting in the way of fully appreciating the current chapter. For example, as I continue to replay conversations about the kinds of jobs I should (and should not) apply to, I unintentionally force myself to second guess my decision to work at a liberal arts university. Am I really happy here? Well, yes, I am! I am tired of frequently doing the math in my head to remind myself that I fought for this job, a job that is great for me in so many ways, and that I see no reasons to seriously consider leaving. In other words, it seems as long as I ruminate over the past, I cannot fully appreciate the present. Second, I tend to ignore the positive aspects of my graduate training by obsessing over the negatives. I received training at one of the top sociology programs in the nation, which opened many doors for my career. I became, in my humble opinion, a strong scholar and teacher. In some ways, I was even supported in developing my own type of academic career. Overall, I do not regret attending the program, or pursuing a PhD in general. I made friendships that I suspect will last a lifetime. As long as I cling to resentment, I hesitate to connect with my mentors, which I now realize is a foolish mistake because they can (and probably will) remain mentors for life. I actually limit the good that came from my graduate training by maintaining my resentment-filled distance. Finally, I need to relinquish the victim status I have unconsciously developed. I tend to think of what I endured and the compromises I made in order to get my PhD; I tend to lose sight of what I gained. It is too easy to focus on the ways in which I am wounded — fearful, uncertain, lacking confidence — rather than feeling empowered. In a way, the path to forgiveness will probably entail forgiving myself. What I endured was not so much loss or compromise as it was an investment for developing the kind of career I want. I did the best that I could; and, even with a few bumps and bruises, I actually did pretty damn well. Even just in writing this paragraph, I suddenly feel a sense of pride that is probably stuffed under the resentment, disappointment, and doubt. Where this path goes is as much of a mystery to me as it is to you. I will not be surprised by bumps and setbacks, tapping into pockets of my spirit that I did not know were still bound by anger and hurt. I hope, once successful, that I can comfortably focus on the present and reflect on the past only to provide useful advice to others. I will even challenge myself, starting now, to write about the previous chapter of my life only if to offer advice, or privately if it will help work toward forgiveness. Academia is toxic enough. I plan to become a voice of hope and kindness.